60 years of Rock and Roll. 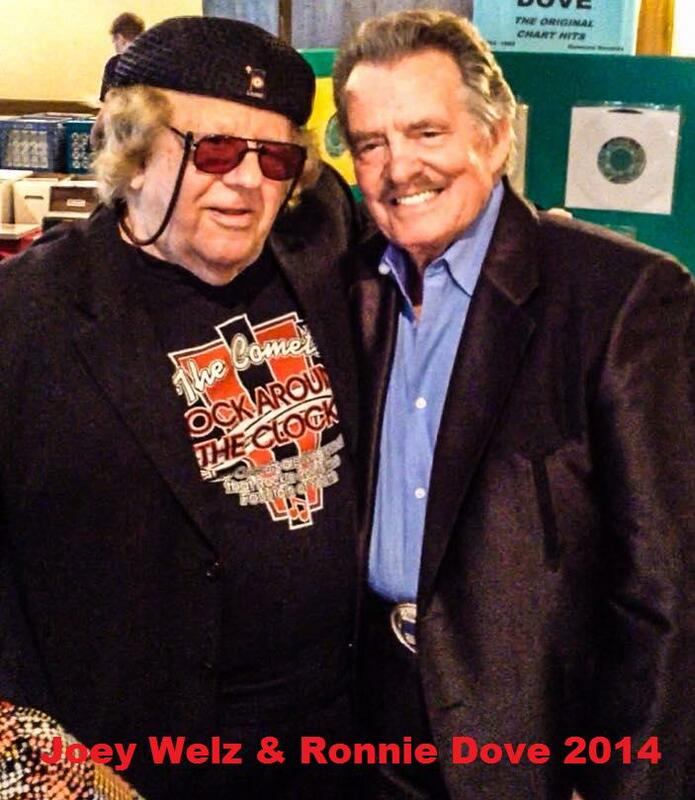 Joey and Ronnie have been life long friends and both started their careers in music in Baltimore on WCAO radio. AFTER THE GREAT SUCCESS OF » ROCK AROUND THE CLOCK » JOEY CO-WROTE SEVERAL REVISED VERSIONS OF THE SONG WITH THE ORIGINAL WRITER JIMMY DeKNIGHT (A.K.A.JAMES E.MYERS). HIS HEAVY METAL VERSION HIT THE CHARTS ALL OVER THE WORLD IN THE 80S AND HIS ROCKABILLY VERSION WENT TOP 10 IN THE 90S ON THE WORLD WIDE INDEPENDENT COUNTRY CHARTS…. NOW IN 2004, JOEY UPDATED THE SONG IN A MODERN NEW ARRANGEMENT AIMED DIRECTLY AT THE YOUTH OF THE 21ST CENTURY. »ROCK AROUND THE CLOCK FOREVER »COMBINES ROCK AND ROLL WITH HIP HOP. IT IS GAINING A WHOLE NEW WORLDWIDE AUDIENCE WITH HEAVY EUROPEAN RADIO AIRPLAY. NOW JOEY WELZ HAS REINVENTED HIMSELF AS THE COMET M.C., TRULLY THE INOVATOR OF ROCK ON CAPRICE INTERNTIONAL RECORDS, U.S.A.
Joey was recently inducted into the ROCKABILLY HALL OF FAME with BILL BLACK and CHARLIE RICH. In 2008 he was inducted into the MEMPHIS HERITAGE MUSIC HALL OF FAME with JOHNNY NASH, WILLIE MITCHELL and the BARKEYS. His bio was featured in the INTERNATIONAL MUSICIAN MAGAZINE of the A. F. of M. and ROLLING STONE named him one of the top 100 IMORTALS OF ROCK & ROLL. Joey tours France every year with the CAPTAIN JOE COMBO and has released 2 new albums with his French Band; REWIND MY ROCK AND ROLL and ROCK AND ROLL YEARS. He will tour France with the CAPTAIN JOE COMBO this summer, opening for Phil Collins and again in January of 2010. He also reunited with his old friend AL RAPPA and is playing selected dates with BIL HALEY'S COMETS. He has recently opened his HOME OF A COMET as the ROCK AROUND THE CLOCK MUSEUM, which he started with JIMMY De KNIGHT, the original writer of ROCK AROUND THE CLOCK. To celebrate Joey's 50th Anniversary, CANADIAN AMERICAN has released 2 new versions of the song by Joey. One is COUNYRY and the other is HIP-HOP. Both songs feature Joey as a co-writer with the songs originator, JIMMYDeKNIGHT. New cds are: THE STORY OF AN AMERICANIDOL and THE COMET MC'S GREATEST HITS....Rock & Roll is here to stay and so is WELZ who just keeps ROCKIN'. In 2012 Joey Welz again called the Comets together to play for the PBS Rock and Roll 50's and 60's show in Pittsburg. Joey sang Rock Around the Clock, Shake Rattle and Roll and See You Later Alligator with his friend Al Rappa in honor of Bill Haley. In 2013 The Rock and Roll Hall of Fame inducted all the Comets and Rolling Stone Magazine Named Joey Welz one of the top 100 imortals of rock and roll. Now after 60 years of performing Wikipedia honored Joey by including his bio in their website. Visit http://en.wikipedia.org/wiki/Joey_Welz. “FROM THE ROCKIN'OF MY CRADLE TO THE ROLLIN'OF MY HEARSE” early in 2008.In addition to his new music,Joey still finds time to ROCK AROUND THE CLOCK with BILL HALEY'S COMETS(mca).